Until the recent past - and in some countries and cultures it is still the norm - the 1st born was always favored. In the Bible, God shows continually that this is not His way. That God's favor was so often NOT with the first born, we may conclude that God was attempting to make a statement to us about this practice. With surety, we can conclude that God was expressing his ultimate sovereignty when he favored those who were not first born - God's ways are not our ways - His choice is sovereign! Isaiah 55:8-9 "For my thoughts are not your thoughts, neither are your ways my ways," declares the LORD. "As the heavens are higher than the earth, so are my ways higher than your ways and my thoughts than your thoughts. 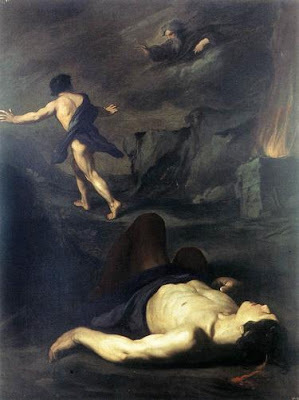 Cain and Abel 1 Adam lay with his wife Eve, and she became pregnant and gave birth to Cain [1st born] . She said, "With the help of the LORD I have brought forth a man." 2 Later she gave birth to his brother Abel [2nd born] . Now Abel kept flocks, and Cain worked the soil. 3 In the course of time Cain brought some of the fruits of the soil as an offering to the LORD. 4 But Abel brought fat portions from some of the firstborn of his flock. The LORD looked with favor on Abel and his offering, 5 but on Cain and his offering he did not look with favor. So Cain was very angry, and his face was downcast. 6 Then the LORD said to Cain, "Why are you angry? Why is your face downcast? 7 If you do what is right, will you not be accepted? But if you do not do what is right, sin is crouching at your door; it desires to have you, but you must master it." Hagar and Ishmael 1 Now Sarai, Abram's wife, had borne him no children. But she had an Egyptian maidservant named Hagar; 2 so she said to Abram, "The LORD has kept me from having children. Go, sleep with my maidservant; perhaps I can build a family through her." Abram agreed to what Sarai said. 3 So after Abram had been living in Canaan ten years, Sarai his wife took her Egyptian maidservant Hagar and gave her to her husband to be his wife. 4 He slept with Hagar, and she conceived. When she knew she was pregnant, she began to despise her mistress. 5 Then Sarai said to Abram, "You are responsible for the wrong I am suffering. I put my servant in your arms, and now that she knows she is pregnant, she despises me. May the LORD judge between you and me." 7 The angel of the LORD found Hagar near a spring in the desert; it was the spring that is beside the road to Shur. 8 And he said, "Hagar, servant of Sarai, where have you come from, and where are you going?" "I'm running away from my mistress Sarai," she answered. 11 The angel of the LORD also said to her: "You are now with child and you will have a son. You shall name him Ishmael, [Ishmael means God hears] for the LORD has heard of your misery. 13 She gave this name to the LORD who spoke to her: "You are the God who sees me," for she said, "I have now seen the One who sees me." 14 That is why the well was called Beer Lahai Roi [Beer Lahai Roi means well of the Living One who sees me] ; it is still there, between Kadesh and Bered. 15 So Hagar bore Abram a son, and Abram gave the name Ishmael [1st born] to the son she had borne. 16 Abram was eighty-six years old when Hagar bore him Ishmael . . . . . Genesis 17: 1-8, 15-22 The Covenant of Circumcision 1 When Abram was ninety-nine years old, the LORD appeared to him and said, "I am God Almighty [Hebrew El-Shaddai ] ; walk before me and be blameless. 2 I will confirm my covenant between me and you and will greatly increase your numbers. "3 Abram fell facedown, and God said to him, 4 "As for me, this is my covenant with you: You will be the father of many nations [plural]. 5 No longer will you be called Abram [Abram means exalted father] ; your name will be Abraham, [Abraham means father of many] for I have made you a father of many nations. 6 I will make you very fruitful; I will make nations of you, and kings will come from you. 7 I will establish my covenant as an everlasting covenant between me and you and your descendants after you for the generations to come, to be your God and the God of your descendants after you. 8 The whole land of Canaan, where you are now an alien, I will give as an everlasting possession to you and your descendants after you; and I will be their God." . . . .15 God also said to Abraham, "As for Sarai your wife, you are no longer to call her Sarai; her name will be Sarah. 16 I will bless her and will surely give you a son by her. I will bless her so that she will be the mother of nations [plural] ; kings of peoples will come from her. "17 Abraham fell facedown; he laughed and said to himself, "Will a son be born to a man a hundred years old? Will Sarah bear a child at the age of ninety? " 18 And Abraham said to God, "If only Ishmael [ the 1st born] might live under your blessing! [ Son born to Abraham through Hagar his slave and 2nd wife - Genesis 16: 3]"19 Then God said, "Yes, but your wife Sarah will bear you a son, and you will call him Isaac. [Isaac means he laughs] I will establish my covenant with him as an everlasting covenant for his descendants after him. 20 And as for Ishmael, I have heard you: I will surely bless him; I will make him fruitful and will greatly increase his numbers. He will be the father of twelve rulers, and I will make him into a great nation [singular]. 21 But my covenant I will establish with Isaac, whom Sarah will bear to you by this time next year." 22 When he had finished speaking with Abraham, God went up from him. . . . Genesis 21: 1-20 The Birth of Isaac 1 Now the LORD was gracious to Sarah as he had said, and the LORD did for Sarah what he had promised. 2 Sarah became pregnant and bore a son to Abraham in his old age, at the very time God had promised him. 3 Abraham gave the name Isaac [Isaac means he laughs] to the son Sarah bore him. 4 When his son Isaac was eight days old, Abraham circumcised him, as God commanded him. 5 Abraham was a hundred years old when his son Isaac was born to him. 6 Sarah said, "God has brought me laughter, and everyone who hears about this will laugh with me." 7 And she added, "Who would have said to Abraham that Sarah would nurse children? Yet I have borne him a son in his old age." Hagar and Ishmael Sent Away 8 The child grew and was weaned, and on the day Isaac was weaned Abraham held a great feast [This would make Ishmael 15-17 years old] . 9 But Sarah saw that the son whom Hagar the Egyptian had borne to Abraham was mocking, 10 and she said to Abraham, "Get rid of that slave woman and her son, for that slave woman's son will never share in the inheritance with my son Isaac." 11 The matter distressed Abraham greatly because it concerned his [1st born] son. 12 But God said to him, "Do not be so distressed about the boy and your maidservant. Listen to whatever Sarah tells you, because it is through Isaac that your offspring [seed] will be reckoned. 13 I will make the son of the maidservant into a nation [singular] also, because he is your offspring." 15 When the water in the skin was gone, she put the boy under one of the bushes. 16 Then she went off and sat down nearby, about a bowshot away, for she thought, "I cannot watch the boy die." And as she sat there nearby, she began to sob. 17 God heard the boy crying, and the angel of God called to Hagar from heaven and said to her, "What is the matter, Hagar? Do not be afraid; God has heard the boy crying as he lies there. 18 Lift the boy up and take him by the hand, for I will make him into a great nation [singular]." 19 This is the account of Abraham's son Isaac. Abraham became the father of Isaac, 20 and Isaac was forty years old when he married Rebekah daughter of Bethuel the Aramean from Paddan Aram [Northwest Mesopotamia] and sister of Laban the Aramean. 21 Isaac prayed to the LORD on behalf of his wife, because she was barren. The LORD answered his prayer, and his wife Rebekah became pregnant. 22 The babies jostled each other within her, and she said, "Why is this happening to me?" So she went to inquire of the LORD. 24 When the time came for her to give birth, there were twin boys in her womb. 25 The first to come out was red, and his whole body was like a hairy garment; so they named him Esau. [Esau may mean hairy ; he was also called Edom, which means red.] 26 After this, his brother came out, with his hand grasping Esau's heel; so he was named Jacob. [Jacob means he grasps the heel (figuratively, he deceives )] Isaac was sixty years old when Rebekah gave birth to them. 27 The boys grew up, and Esau became a skillful hunter, a man of the open country, while Jacob was a quiet man, staying among the tents. 28 Isaac, who had a taste for wild game, loved Esau, but Rebekah loved Jacob. 2 Isaac said, "I am now an old man and don't know the day of my death. 3 Now then, get your weapons—your quiver and bow—and go out to the open country to hunt some wild game for me. 4 Prepare me the kind of tasty food I like and bring it to me to eat, so that I may give you my blessing before I die." 5 Now Rebekah was listening as Isaac spoke to his son Esau. 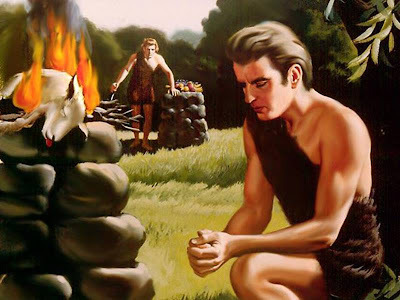 When Esau left for the open country to hunt game and bring it back, 6 Rebekah said to her son Jacob, "Look, I overheard your father say to your brother Esau, 7 'Bring me some game and prepare me some tasty food to eat, so that I may give you my blessing in the presence of the LORD before I die.' 8 Now, my son, listen carefully and do what I tell you: 9 Go out to the flock and bring me two choice young goats, so I can prepare some tasty food for your father, just the way he likes it. 10 Then take it to your father to eat, so that he may give you his blessing before he dies." 11 Jacob said to Rebekah his mother, "But my brother Esau is a hairy man, and I'm a man with smooth skin. 12 What if my father touches me? I would appear to be tricking him and would bring down a curse on myself rather than a blessing." 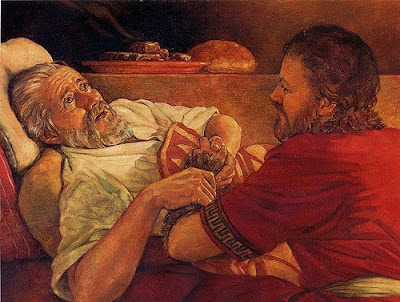 22 Jacob went close to his father Isaac, who touched him and said, "The voice is the voice of Jacob, but the hands are the hands of Esau." 23 He did not recognize him, for his hands were hairy like those of his brother Esau; so he blessed him. 24 "Are you really my son Esau?" he asked. "I am," he replied. 25 Then he said, "My son, bring me some of your game to eat, so that I may give you my blessing." Jacob brought it to him and he ate; and he brought some wine and he drank. 26 Then his father Isaac said to him, "Come here, my son, and kiss me." 27 So he went to him and kissed him. When Isaac caught the smell of his clothes, he blessed him and said, "Ah, the smell of my son is like the smell of a field that the LORD has blessed. 30 After Isaac finished blessing him and Jacob had scarcely left his father's presence, his brother Esau came in from hunting. 31 He too prepared some tasty food and brought it to his father. Then he said to him, "My father, sit up and eat some of my game, so that you may give me your blessing." 33 Isaac trembled violently and said, "Who was it, then, that hunted game and brought it to me? I ate it just before you came and I blessed him—and indeed he will be blessed! " 35 But he said, "Your brother came deceitfully and took your blessing ." 36 Esau said, "Isn't he rightly named Jacob [Jacob means he grasps the heel (figuratively, he deceives ). ] ? He has deceived me these two times: He took my birthright, and now he's taken my blessing!" Then he asked, "Haven't you reserved any blessing for me?" 39 His father Isaac answered him, "Your dwelling will be away from the earth's richness, away from the dew of heaven above. 42 When Rebekah was told what her older son Esau had said, she sent for her younger son Jacob and said to him, "Your brother Esau is consoling himself with the thought of killing you. 43 Now then, my son, do what I say: Flee at once to my brother Laban in Haran. 44 Stay with him for a while until your brother's fury subsides. 45 When your brother is no longer angry with you and forgets what you did to him, I'll send word for you to come back from there. Why should I lose both of you in one day?" 10 Jacob left Beersheba and set out for Haran. 11 When he reached a certain place, he stopped for the night because the sun had set. Taking one of the stones there, he put it under his head and lay down to sleep. 12 He had a dream in which he saw a stairway [Or ladder] resting on the earth, with its top reaching to heaven, and the angels of God were ascending and descending on it. 13 There above it stood the LORD, and he said: "I am the LORD, the God of your father Abraham and the God of Isaac. I will give you and your descendants the land on which you are lying. 14 Your descendants will be like the dust of the earth, and you will spread out to the west and to the east, to the north and to the south. All peoples on earth will be blessed through you and your offspring. 15 I am with you and will watch over you wherever you go, and I will bring you back to this land. I will not leave you until I have done what I have promised you." 16 When Jacob awoke from his sleep, he thought, "Surely the LORD is in this place, and I was not aware of it." 17 He was afraid and said, "How awesome is this place! This is none other than the house of God; this is the gate of heaven." 18 Early the next morning Jacob took the stone he had placed under his head and set it up as a pillar and poured oil on top of it. 19 He called that place Bethel, [Bethel means house of God] though the city used to be called Luz. 20 Then Jacob made a vow, saying, "If God will be with me and will watch over me on this journey I am taking and will give me food to eat and clothes to wear 21 so that I return safely to my father's house, then the LORD will be my God 22 and this stone that I have set up as a pillar will be God's house, and of all that you give me I will give you a tenth." 22 That night Jacob got up and took his two wives, his two maidservants and his eleven sons and crossed the ford of the Jabbok. 23 After he had sent them across the stream, he sent over all his possessions. 24 So Jacob was left alone, and a man wrestled with him till daybreak. 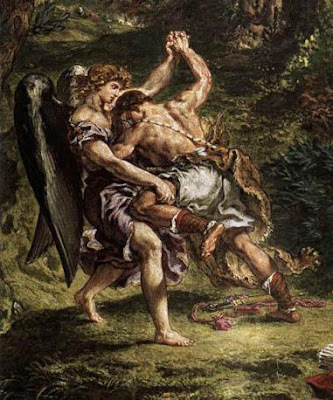 25 When the man saw that he could not overpower him, he touched the socket of Jacob's hip so that his hip was wrenched as he wrestled with the man. 26 Then the man said, "Let me go, for it is daybreak." But Jacob replied, "I will not let you go unless you bless me." 27 The man asked him, "What is your name?" "Jacob," he answered. 28 Then the man said, "Your name will no longer be Jacob, but Israel, [Israel means he struggles with God . ] because you have struggled with God and with men and have overcome." 29 Jacob said, "Please tell me your name." But he replied, "Why do you ask my name?" Then he blessed him there. 30 So Jacob called the place Peniel, [Peniel means face of God .] saying, "It is because I saw God face to face, and yet my life was spared." 31 The sun rose above him as he passed Peniel, and he was limping because of his hip. 32 Therefore to this day the Israelites do not eat the tendon attached to the socket of the hip, because the socket of Jacob's hip was touched near the tendon. 1 Then God said to Jacob, "Go up to Bethel and settle there, and build an altar there to God, who appeared to you when you were fleeing from your brother Esau." . . . . 9 After Jacob returned from Paddan Aram, [Northwest Mesopotamia] God appeared to him again and blessed him. 10 God said to him, "Your name is Jacob, but you will no longer be called Jacob; your name will be Israel. [Israel means he struggles with God .] " So he named him Israel. 11 And God said to him, "I am God Almighty [Hebrew El-Shaddai ] ; be fruitful and increase in number. A nation and a community of nations will come from you, and kings will come from your body. 12 The land I gave to Abraham and Isaac I also give to you, and I will give this land to your descendants after you." 13 Then God went up from him at the place where he had talked with him. Rachel and Leah - God's favor is not so clear between these 2 sister. Rachel (the youngest) appears to have the immediate favor because she was Jacob's favorite wife and she eventually became the mother of Joseph. However she was to die in childbirth with her 2nd son Benjamin. Leah became the mother of Judah and it was through this lineage that Christ was born. One of Jesus' names is Lion of Judah ! 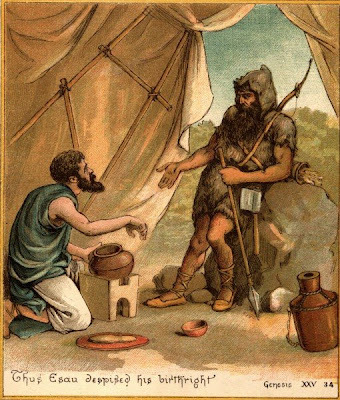 14 . . . After Jacob had stayed with him for a whole month, 15 Laban said to him, "Just because you are a relative of mine, should you work for me for nothing? Tell me what your wages should be." 16 Now Laban had two daughters; the name of the older was Leah, and the name of the younger was Rachel. 17 Leah had weak eyes, but Rachel was lovely in form, and beautiful. 18 Jacob was in love with Rachel and said, "I'll work for you seven years in return for your younger daughter Rachel." 19 Laban said, "It's better that I give her to you than to some other man. Stay here with me." 20 So Jacob served seven years to get Rachel, but they seemed like only a few days to him because of his love for her. 21 Then Jacob said to Laban, "Give me my wife. My time is completed, and I want to lie with her." 22 So Laban brought together all the people of the place and gave a feast. 23 But when evening came, he took his daughter Leah and gave her to Jacob, and Jacob lay with her. 24 And Laban gave his servant girl Zilpah to his daughter as her maidservant. 25 When morning came, there was Leah! So Jacob said to Laban, "What is this you have done to me? I served you for Rachel, didn't I? Why have you deceived me?" 26 Laban replied, "It is not our custom here to give the younger daughter in marriage before the older one. 27 Finish this daughter's bridal week; then we will give you the younger one also, in return for another seven years of work." 28 And Jacob did so. He finished the week with Leah, and then Laban gave him his daughter Rachel to be his wife. 29 Laban gave his servant girl Bilhah to his daughter Rachel as her maidservant. 30 Jacob lay with Rachel also, and he loved Rachel more than Leah. And he worked for Laban another seven years. Jacob's Children 31 When the LORD saw that Leah was not loved, he opened her womb, but Rachel was barren. 32 Leah became pregnant and gave birth to a son. She named him Reuben, [Reuben sounds like the Hebrew for he has seen my misery ; the name means see, a son .] for she said, "It is because the LORD has seen my misery. Surely my husband will love me now." 35 She conceived again, and when she gave birth to a son she said, "This time I will praise the LORD." So she named him Judah. [Judah sounds like and may be derived from the Hebrew for praise . ] Then she stopped having children. 22 Then God remembered Rachel; he listened to her and opened her womb. 23 She became pregnant and gave birth to a son and said, "God has taken away my disgrace." 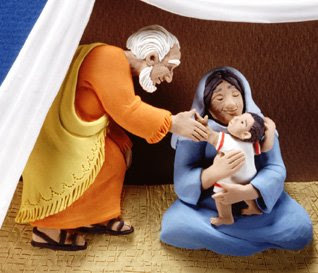 24 She named him Joseph, [Joseph means may he add .] and said, "May the LORD add to me another son." 19 So Rachel died and was buried on the way to Ephrath (that is, Bethlehem). 20 Over her tomb Jacob set up a pillar, and to this day that pillar marks Rachel's tomb. 1 Then the LORD said to Moses, "See, I have made you like God to Pharaoh, and your brother Aaron will be your prophet. 2 You are to say everything I command you, and your brother Aaron is to tell Pharaoh to let the Israelites go out of his country. 3 But I will harden Pharaoh's heart, and though I multiply my miraculous signs and wonders in Egypt, 4 he will not listen to you. Then I will lay my hand on Egypt and with mighty acts of judgment I will bring out my divisions, my people the Israelites. 5 And the Egyptians will know that I am the LORD when I stretch out my hand against Egypt and bring the Israelites out of it." 1 Miriam and Aaron began to talk against Moses because of his Cushite wife, for he had married a Cushite. 2 "Has the LORD spoken only through Moses?" they asked. "Hasn't he also spoken through us?" And the LORD heard this. 4 At once the LORD said to Moses, Aaron and Miriam, "Come out to the Tent of Meeting, all three of you." So the three of them came out. 5 Then the LORD came down in a pillar of cloud; he stood at the entrance to the Tent and summoned Aaron and Miriam. When both of them stepped forward, 6 he said, "Listen to my words: "When a prophet of the LORD is among you, I reveal myself to him in visions, I speak to him in dreams. 7 But this is not true of my servant Moses; he is faithful in all my house. 8 With him I speak face to face, clearly and not in riddles; he sees the form of the LORD. Why then were you not afraid to speak against my servant Moses?" 10 When the cloud lifted from above the Tent, there stood Miriam—leprous, like snow. Aaron turned toward her and saw that she had leprosy; 11 and he said to Moses, "Please, my lord, do not hold against us the sin we have so foolishly committed. 12 Do not let her be like a stillborn infant coming from its mother's womb with its flesh half eaten away." 14 The LORD replied to Moses, "If her father had spit in her face, would she not have been in disgrace for seven days? Confine her outside the camp for seven days; after that she can be brought back." 15 So Miriam was confined outside the camp for seven days, and the people did not move on till she was brought back. 2 But Samuel said, "How can I go? Saul will hear about it and kill me." The LORD said, "Take a heifer with you and say, 'I have come to sacrifice to the LORD.' 3 Invite Jesse to the sacrifice, and I will show you what to do. You are to anoint for me the one I indicate." 8 Then Jesse called Abinadab and had him pass in front of Samuel. But Samuel said, "The LORD has not chosen this one either." 9 Jesse then had Shammah pass by, but Samuel said, "Nor has the LORD chosen this one." 10 Jesse had seven of his sons pass before Samuel, but Samuel said to him, "The LORD has not chosen these. " 11 So he asked Jesse, "Are these all the sons you have? " "There is still the youngest," Jesse answered, "but he is tending the sheep." Samuel said, "Send for him; we will not sit down until he arrives." 12 So he sent and had him brought in. He was ruddy, with a fine appearance and handsome features. Then the LORD said, "Rise and anoint him; he is the one. " Solomon Favored Over 10 Older Brothers - Solomon was 2nd Son of his Mother Bathsheba, but his older brother died at 7 days because of the sin of his father David. But after David was punished, God forgave him and favored the 2nd son of David and Bathsheba. 5 and the sixth, Ithream the son of David's wife Eglah. These were born to David in Hebron. 1 After the king was settled in his palace and the LORD had given him rest from all his enemies around him, 2 he said to Nathan the prophet, "Here I am, living in a palace of cedar, while the ark of God remains in a tent." 3 Nathan replied to the king, "Whatever you have in mind, go ahead and do it, for the LORD is with you." 8 "Now then, tell my servant David, 'This is what the LORD Almighty says: I took you from the pasture and from following the flock to be ruler over my people Israel. 9 I have been with you wherever you have gone, and I have cut off all your enemies from before you. Now I will make your name great, like the names of the greatest men of the earth. 10 And I will provide a place for my people Israel and will plant them so that they can have a home of their own and no longer be disturbed. Wicked people will not oppress them anymore, as they did at the beginning 11 and have done ever since the time I appointed leaders over my people Israel. I will also give you rest from all your enemies. " 'The LORD declares to you that the LORD himself will establish a house for you: 12 When your days are over and you rest with your fathers, I will raise up your offspring to succeed you, who will come from your own body, and I will establish his kingdom. 13 He is the one who will build a house for my Name, and I will establish the throne of his kingdom forever. 14 I will be his father, and he will be my son. When he does wrong, I will punish him with the rod of men, with floggings inflicted by men. 15 But my love will never be taken away from him, as I took it away from Saul, whom I removed from before you. 16 Your house and your kingdom will endure forever before me ; your throne will be established forever.' "
1 In the spring, at the time when kings go off to war, David sent Joab out with the king's men and the whole Israelite army. They destroyed the Ammonites and besieged Rabbah. But David remained in Jerusalem. 2 One evening David got up from his bed and walked around on the roof of the palace. From the roof he saw a woman bathing. The woman was very beautiful, 3 and David sent someone to find out about her. The man said, "Isn't this Bathsheba, the daughter of Eliam and the wife of Uriah the Hittite?" 4 Then David sent messengers to get her. She came to him, and he slept with her. (She had purified herself from her uncleanness.) Then [a] she went back home. 5 The woman conceived and sent word to David, saying, "I am pregnant." 6 So David sent this word to Joab: "Send me Uriah the Hittite." And Joab sent him to David. 7 When Uriah came to him, David asked him how Joab was, how the soldiers were and how the war was going. 8 Then David said to Uriah, "Go down to your house and wash your feet." So Uriah left the palace, and a gift from the king was sent after him. 9 But Uriah slept at the entrance to the palace with all his master's servants and did not go down to his house. 10 When David was told, "Uriah did not go home," he asked him, "Haven't you just come from a distance? Why didn't you go home?" 11 Uriah said to David, "The ark and Israel and Judah are staying in tents, and my master Joab and my lord's men are camped in the open fields. How could I go to my house to eat and drink and lie with my wife? As surely as you live, I will not do such a thing!" 12 Then David said to him, "Stay here one more day, and tomorrow I will send you back." So Uriah remained in Jerusalem that day and the next. 13 At David's invitation, he ate and drank with him, and David made him drunk. But in the evening Uriah went out to sleep on his mat among his master's servants; he did not go home. 14 In the morning David wrote a letter to Joab and sent it with Uriah. 15 In it he wrote, "Put Uriah in the front line where the fighting is fiercest. Then withdraw from him so he will be struck down and die." 18 Joab sent David a full account of the battle. 19 He instructed the messenger: "When you have finished giving the king this account of the battle, 20 the king's anger may flare up, and he may ask you, 'Why did you get so close to the city to fight? Didn't you know they would shoot arrows from the wall? 21 Who killed Abimelech son of Jerub-Besheth ? Didn't a woman throw an upper millstone on him from the wall, so that he died in Thebez? Why did you get so close to the wall?' If he asks you this, then say to him, 'Also, your servant Uriah the Hittite is dead.' "
22 The messenger set out, and when he arrived he told David everything Joab had sent him to say. 23 The messenger said to David, "The men overpowered us and came out against us in the open, but we drove them back to the entrance to the city gate. 24 Then the archers shot arrows at your servants from the wall, and some of the king's men died. Moreover, your servant Uriah the Hittite is dead." 25 David told the messenger, "Say this to Joab: 'Don't let this upset you; the sword devours one as well as another. Press the attack against the city and destroy it.' Say this to encourage Joab." 1 The LORD sent Nathan to David. When he came to him, he said, "There were two men in a certain town, one rich and the other poor. 2 The rich man had a very large number of sheep and cattle, 3 but the poor man had nothing except one little ewe lamb he had bought. He raised it, and it grew up with him and his children. It shared his food, drank from his cup and even slept in his arms. It was like a daughter to him. 4 "Now a traveler came to the rich man, but the rich man refrained from taking one of his own sheep or cattle to prepare a meal for the traveler who had come to him. Instead, he took the ewe lamb that belonged to the poor man and prepared it for the one who had come to him." 5 David burned with anger against the man and said to Nathan, "As surely as the LORD lives, the man who did this deserves to die! 6 He must pay for that lamb four times over, because he did such a thing and had no pity." 11 "This is what the LORD says: 'Out of your own household I am going to bring calamity upon you. Before your very eyes I will take your wives and give them to one who is close to you, and he will lie with your wives in broad daylight. 12 You did it in secret, but I will do this thing in broad daylight before all Israel.' "
13 Then David said to Nathan, "I have sinned against the LORD." Nathan replied, "The LORD has taken away your sin. You are not going to die. 14 But because by doing this you have made the enemies of the LORD show utter contempt, the son born to you will die." 15 After Nathan had gone home, the LORD struck the child that Uriah's wife had borne to David, and he became ill. 16 David pleaded with God for the child. He fasted and went into his house and spent the nights lying on the ground. 17 The elders of his household stood beside him to get him up from the ground, but he refused, and he would not eat any food with them. 18 On the seventh day the child died. David's servants were afraid to tell him that the child was dead, for they thought, "While the child was still living, we spoke to David but he would not listen to us. How can we tell him the child is dead? He may do something desperate." 19 David noticed that his servants were whispering among themselves and he realized the child was dead. "Is the child dead?" he asked. "Yes," they replied, "he is dead." 21 His servants asked him, "Why are you acting this way? While the child was alive, you fasted and wept, but now that the child is dead, you get up and eat!" 22 He answered, "While the child was still alive, I fasted and wept. I thought, 'Who knows? The LORD may be gracious to me and let the child live.' 23 But now that he is dead, why should I fast? Can I bring him back again? I will go to him, but he will not return to me." 29 The king then took an oath: "As surely as the LORD lives, who has delivered me out of every trouble, 30 I will surely carry out today what I swore to you by the LORD, the God of Israel: Solomon your son shall be king after me, and he will sit on my throne in my place." 32 King David said, "Call in Zadok the priest, Nathan the prophet and Benaiah son of Jehoiada." When they came before the king, 33 he said to them: "Take your lord's servants with you and set Solomon my son on my own mule and take him down to Gihon. 34 There have Zadok the priest and Nathan the prophet anoint him king over Israel. 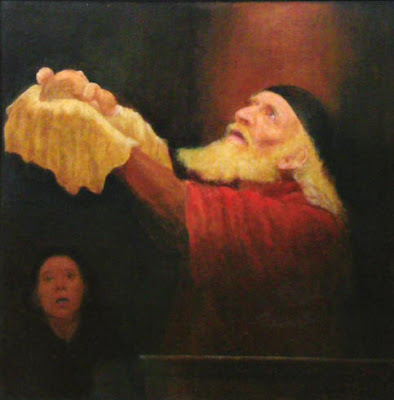 Blow the trumpet and shout, 'Long live King Solomon!' 35 Then you are to go up with him, and he is to come and sit on my throne and reign in my place. I have appointed him ruler over Israel and Judah." 36 Benaiah son of Jehoiada answered the king, "Amen! May the LORD, the God of my lord the king, so declare it. 37 As the LORD was with my lord the king, so may he be with Solomon to make his throne even greater than the throne of my lord King David!" 38 So Zadok the priest, Nathan the prophet, Benaiah son of Jehoiada, the Kerethites and the Pelethites went down and put Solomon on King David's mule and escorted him to Gihon. 39 Zadok the priest took the horn of oil from the sacred tent and anointed Solomon. Then they sounded the trumpet and all the people shouted, "Long live King Solomon!" 40 And all the people went up after him, playing flutes and rejoicing greatly, so that the ground shook with the sound. 1 Solomon made an alliance with Pharaoh king of Egypt and married his daughter. He brought her to the City of David until he finished building his palace and the temple of the LORD, and the wall around Jerusalem. 2 The people, however, were still sacrificing at the high places, because a temple had not yet been built for the Name of the LORD. 3 Solomon showed his love for the LORD by walking according to the statutes of his father David, except that he offered sacrifices and burned incense on the high places. 4 The king went to Gibeon to offer sacrifices, for that was the most important high place, and Solomon offered a thousand burnt offerings on that altar. 5 At Gibeon the LORD appeared to Solomon during the night in a dream, and God said, "Ask for whatever you want me to give you." 6 Solomon answered, "You have shown great kindness to your servant, my father David, because he was faithful to you and righteous and upright in heart. You have continued this great kindness to him and have given him a son to sit on his throne this very day. 7 "Now, O LORD my God, you have made your servant king in place of my father David. But I am only a little child and do not know how to carry out my duties. 8 Your servant is here among the people you have chosen, a great people, too numerous to count or number. 9 So give your servant a discerning heart to govern your people and to distinguish between right and wrong. For who is able to govern this great people of yours?" 10 The Lord was pleased that Solomon had asked for this. 11 So God said to him, "Since you have asked for this and not for long life or wealth for yourself, nor have asked for the death of your enemies but for discernment in administering justice, 12 I will do what you have asked. I will give you a wise and discerning heart, so that there will never have been anyone like you, nor will there ever be. 13 Moreover, I will give you what you have not asked for—both riches and honor—so that in your lifetime you will have no equal among kings. 14 And if you walk in my ways and obey my statutes and commands as David your father did, I will give you a long life." 15 Then Solomon awoke—and he realized it had been a dream. He returned to Jerusalem, stood before the ark of the Lord's covenant and sacrificed burnt offerings and fellowship offerings. Then he gave a feast for all his court.